With cooling needs at a minimum, winter is a great time for homeowners to take care of any problems that might be affecting their air conditioner’s performance. If you schedule service now, you could save a lot of money on AC repairs with All American Air Conditioning of Havasu. 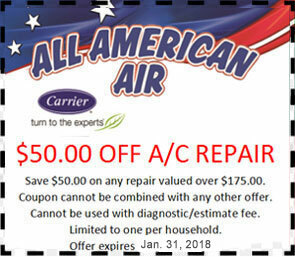 Now through Jan. 31, 2018, this trusted HVAC contractor in Mohave County, AZ, is offering $50 off on all air conditioning repair services priced over $175. If your home’s indoor cooling wasn’t at peak performance last year, scheduling AC repair now could save you from big problems when things start to heat up again. For example, you might need a professional fix if you had trouble maintaining temperatures, experienced higher-than-average energy bills, or faced frequent mechanical problems. Specializing in HVAC system care, All American Air Conditioning of Havasu can properly assess and address problems like these. If your repair costs $175 or more, you can apply this limited-time $50 discount on your service charges. Coupons are limited to one use per household, cannot be combined with other offers, and are not applicable to diagnostic or estimate charges. Schedule Easy AC Repair Today! If you want to take advantage of this $50 off coupon, service must be scheduled by Jan. 31, 2018. With such a hot deal, you won’t want to wait to take care of your home’s cooling needs. To learn more about all the AC services these professionals offer, visit All American Air Conditioning of Havasu online. If you’re ready to save money on your AC repairs in Lake Havasu City, call (928) 855-4549 to speak with a friendly technician.